Lately while making my normal thrifting circuits, I have found the absolute minimum. It seems like people have yet to indulge in spring cleaning to rid themselves of unwanted vintage goodies. 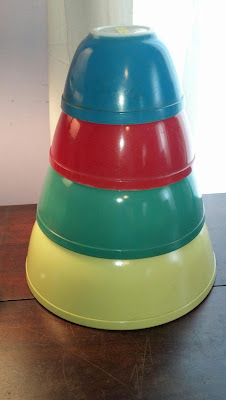 I was beginning to loose all hope until I stumbled upon a set of mixing bowls sitting happily on the shelf at goodwill, waiting for me I presume. When I lifted one up, I was tickled pink to discover they were a complete primary set! Even better, the red and yellow bowls were the older style, unnumbered. I know what you're waiting for, what did they cost? Weren't they outrageous with Goodwill's pricing strategies of late? Ready for it...perhaps sit down... the entire set came to a grand total of $8.39! 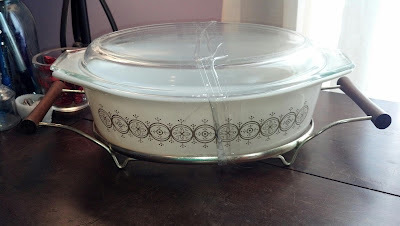 Also on my short list of recent finds was this Olive Medallion promotional casserole complete with cradle that was Dad was awesome enough to spot and bring home for me! Go Dad! Well that's all for now folks, as a bit of a teaser for y'all...I went shopping today. And I broke my budget big time. And I came home with 10 pieces of Pyrex. And another goodie I am super tickled to share! Hopefully another blog post coming soon! Linking up over at Thriftasaurus! WOAH! That primary set was a steal! I love promo pieces so I am jealous of the casserole. Very intrigued by your big Pyrex purchase--do spill! That's a great price- congratulations! Woohooo!!! Score for you!! Still working on my primary - yours looks in wonderful shape. Olive Medallion looks pretty too. What a find!! I just need the red bowl to complete my set...great score! Lucky! Great to hear someone scoring at Goodwill! & you have a great dad. Yay!!!! That is an amazing price for a Primary set! They all look to be in super shiny condition. I am proud to say that this is one of my few fully thrifted sets and only set me back $12.00 to put it all together. Have a wonderful week & share the rest of the goods soon!! Wow! Totally jealous of that primary set. I'm trying to put one together but all I have is a red 402 that lost its shine. I found a green 403 this weekend, but it was so badly dishwashered that most of the color was gone. Those are some beautiful finds! Pyrex my favorite the olive medallion promotional casserole I've never seen before I'm on the hunt for one now. Your dad did good you have some great finds. Love hearing when people still find great Pyrex at goodwill, I would guess it has been over a year since I have! Congrats on the bowls, love a great primary set!